What can DBGitalia offer your business? Ex-cellar &/or grouped in the Langhe, DBGitalia offers classic Italian fine wines that have been hand-picked by David Berry Green (DBG) from across Italy. DBGitalia’s mission is to match producers & their wines with suitable importers & distributors; to find them a good home. David Berry Green (DBG), former buyer at Berry Bros. & Rudd, has twenty years experience working in the industry, fifteen years of which as a buyer of Italian wines. The DBGitalia business is based in London, but since 2009 DBG has been mostly living in Italy, in the Langhe – travelling between his studio in Barolo & office in London – building relationships with the up & coming producers along with more established cantine. He’s put together a hand-picked portfolio, a ‘family’ of classic fine wine producers, not just from Piedmont’s Langhe region but also from across Italy. Producers whose wines clearly express the territory, a sense of place, traditions, grape fruitiness & delicious potential. Being resident in Italy enables DBG to offer DBGitalia customers any assistance when arranging visits, offering inside knowledge & recommendations regarding producers & their wines. DBG is also on hand to guide (potential) customers through the plethora of Italian fine wine regions & styles, & point them in the right direction of the wine they’re after so as to ensure a perfect match. The business & its customers are supported by Chloe Dale-Harris (CDH), Manager DBGitalia London, who is based at the DBGitalia office & headquarters in London, N16 9BL. DBGitalia is well placed to supply customers with advice & ex-cellar delivery support. Raised unsurprisingly on a diet of Bordeaux, Burgundy & Rhone, & then subsequently gaining further experience as the Berry Bros. & Rudd buyer of Burgundy, Loire, Alsace, Australia, New Zealand, Austria, Germany & South Africa, David Berry Green (DBG)’s interest in Italy’s great wines was piqued during a holiday visit to the Langhe region in the early 1990s. He recalls visiting two Barolo producers: one making dense, dark, extracted wine (a so called “modernist”! ), the other pale, elegant, perfumed, ethereal wines (a “traditonalist”). From that moment he vowed to himself that one day he would unearth more of those beautiful “traditionalist” wines & their like for the benefit of his (UK) customers. To introduce them to the truly great wines of Italy. Fast-forward to the mid-2000s: the fine wine world was still hungover with barriques, ‘ameliorative’ international grape varieties (French), branding, & Parker. But one sip of Stella di Campalto’s mesmerising 2003 Rosso di Montalcino, followed soon after by a chance encounter with Giovanni Montisci’s 2005 ‘Barrosu’ Cannonau di Sardegna during a family holiday convinced DBG there was something very exciting stirring in Italy’s cantine; a year later in 2008 he made the seminal trip to Piedmont. 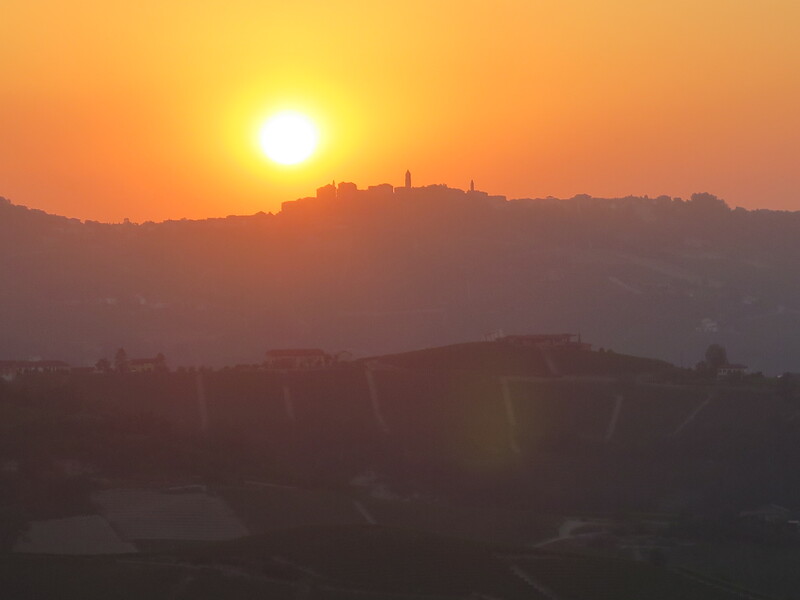 DBG was so moved by the Barolo wines of the Langhe village of Serralunga d’Alba, & in particular by those being made by young Giovanni Rosso, that he decided to stay & explore what Italy, the land of the vine, had to offer. DBG is naturally close to the Nebbiolo wines of the Langhe while also offering authentic, finely made examples of wines from Italy’s other provinces, North to South, & from their autocthonous, noble grape varieties.